You probably have at least one store you keep coming back to and you really love. You feel welcome and accommodated, but what stands out most is their customer service, ‘Peter’ in particular. You’re not even sure if you should call Peter a sales person, as it feels like talking with a friend who gives you great advice. He knows you drink your coffee black, hate the colour orange, and love anything that comes in blue. He always invites you to special events and never stops surprising you as he comes up with offers that are just right. Basically, he knows what makes you tick. 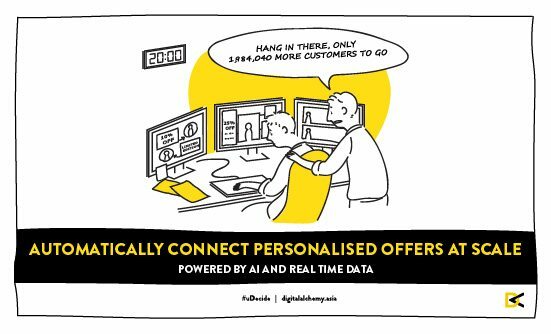 Manually or semi-automatically trying to connect relevant, personalised offers to customers isn’t the answer, but what then? Our machine learning engine, uDecide helps you match the most relevant offers for a particular customer in real time by analysing each customer’s dataset and looking at their profile and transactional behaviour. A simple plug and play decisioning engine designed to help you make smarter decisions on what to talk to your customers about. For you, this means increased operational efficiency and delivering those important personalised and relevant offers that actually connect with your customers. At every interaction with your customer you have to make a decision, what should I say next? Give every customer an offer they can’t resist.